A man who helped the orchestrator of the largest Social Security fraud in U.S. history cut off his ankle bracelet and flee the country pleaded guilty Friday to his role in the escape, admitting he’d spent months working to set it up. Wyatt, 48, assisted along the way, helping arrange the getaway car and making test-runs to see which border checkpoint would be the easiest for his boss to escape through on his journey out of the U.S.
performing the duties and functions not reserved to the Commissioner of Social Security. ... [P]ublic support for a DACA [Deferred Action for Childhood Arrivals] amnesty appears to be widespread, based in part on the public perception that “Dreamers” have committed no crime other than illegal entry. Social Security number misuse by DACA people isn't a victimless crime. False wage reports can cause significant problems for the legitimate number holders. However, drawing DACA people out into the open so that they use legitimate Social Security numbers eliminates the misuse. It has to be the most effective way of reducing the problem. This piece in a right wing newspaper suggests two possible future courses for the Trump Administration -- prosecuting DACA people for Social Security number misuse committed before DACA or using that misuse as justification for deporting DACA people. Either way it starts drawing Social Security further into immigration enforcement and nobody who cares about Social Security wants that. If the DACA people were all from Norway, would this issue be raised? I don't think so. Social Security has recently published National Beneficiary Survey: Disability Statistics, 2015. It contains a jarring statistic on what happens when a recipient of disability benefits returns to work. When that happens and the person's disability benefits are supposed to be adjusted because of the work, 53.2% of the time Social Security gets the adjustment wrong and overpays or underpays the claimant. The Strengthening Protections for Social Security Beneficiaries Act of 2018, H.R. 4547, having to do with representative payees has passed both houses of Congress unanimously and should be signed into law by the President soon. 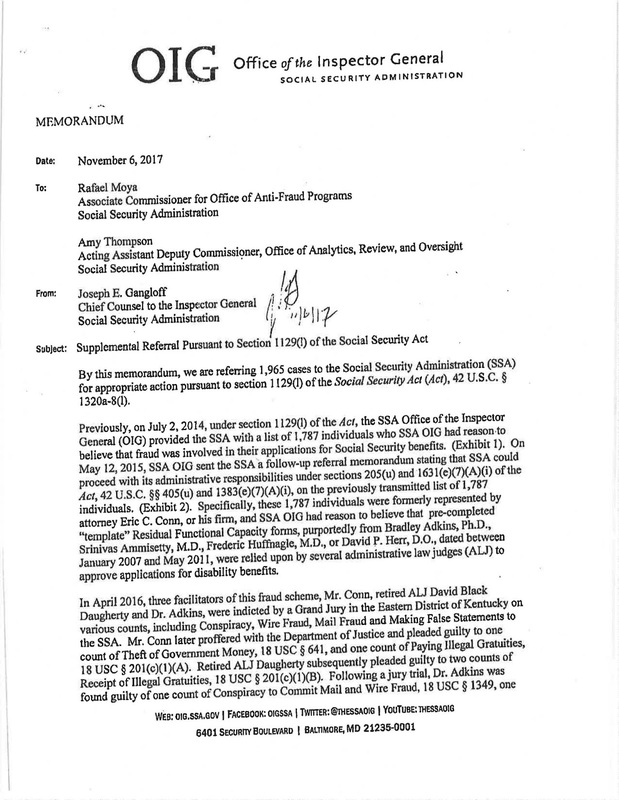 In September 2017, we reported that SSA [Social Security Administration] planned to deliver functionality [of the Disability Case Processing System or DCPS] to support all workloads — including continuing disability reviews and DDS [Disability Determination Services] disability hearings — by April 2018. Since then, SSA has discontinued rolling out DCPS to additional DDSs and re-prioritized its resources to focus on development. The Agency’s new strategy concentrates on increasing the number of DCPS users at participating DDSs and the number of cases the system processes. On January 27, 2018, SSA deployed another major release into production. The Agency reported this release added functionality to support most adult and child initial and reconsideration claims. As of February 28, 2018, 10 DDSs had processed 6,477 disability cases using DCPS. Based on SSA’s cost estimates, as of February 2018, cumulative costs for the new DCPS project were about $80 million. This does not include SSA’s costs to develop the prior version of DCPS. The Social Security Administration has released its annual grand compendium of data, the Statistical Supplement. The data is a year old but still useful. Below is one table readers may find interesting. Note the declining Administrative Law Judge (ALJ) productivity. CMS [Centers for Medicare and Medicaid Services]data could help SSA determine the suitability of organizational payee applicants and existing organizational payees that are nursing homes. Generally, the Agency relies on information provided by organizational payees and monitoring reviews to assess 15 suitability factors. However, these sources were not sufficient in providing the Agency with reliable information to assess four of these factors. However, CMS’ nursing home data could provide SSA with useful, relevant, timely, and independent information related to 11 of the 15 suitability factors, including the 4 factors for which the Agency did not have a reliable source for evaluation. SSA determined that 38 organizational payees were suitable and qualified to serve beneficiaries even though CMS deemed them as chronically underperforming or assessed them the highest fines because of serious and uncorrected deficiencies. From 2012 to 2016, CMS assessed the organizational payees 1,675 deficiencies and issued them $9.5 million in penalties. Further, CMS terminated six of the organizational payees from Medicare /Medicaid for providing substandard quality care; four subsequently closed. SSA conducts monitoring reviews for organizational payees that meet certain criteria. Since 2012, SSA had reviewed 3 of the 38 organizational payees and did not identify any issues that affected their suitability. One of the organizational payees had since closed. Funding Bill Passes -- Will Trump Sign It? Congress has passed and sent to the President an omnibus appropriations bill that will finally fund the Social Security Administration and other federal agencies through the end of the federal fiscal year, September 30, 2018. The bill contained a last minute addition pertaining to Social Security. The agency was instructed not to close or, perhaps I should say, to reopen a Milwaukee field office that it had recently closed. Gun nuts are concerned that the bill would allow Social Security to again adopt regulations that would prevent seriously mentally ill Social Security recipients with representative payees from purchasing firearms. The Obama Administration had adopted that set of regulations but Congress blocked them early last year. Readoption of those regulations wouldn't happen until there's a change in the White House. Update: Yesterday, Donald Trump said he would sign the omnibus appropriations bill. Today, after it passes, he's threatening to veto it. There's a government shutdown beginning at midnight tonight if he vetoes it. Further update: Yes, Trump did sign it. The Omnibus Appropriations bill is out. The Social Security portion gives the agency an additional $480 million but earmarks $280 million of this for IT. Social Security certainly needs IT but this sounds more like an attempt to make sure that politically connected contractors get theirs before agency operations. There is a $100 million earmark for the hearing backlog but what about the agency's field offices, payment centers and teleservice centers? Good luck. Sounds like they don't get enough to even keep up with inflation. On this one, I think it's important to note that a big part of this is that women are much more likely to have knee problems than men. For reasons having to do with anatomy and physiology women are generally more susceptible to other joint problems as well. Politicians in Milwaukee are fighting to reopen the Social Security field office that closed there recently. Their effort is unlikely to work but it may deter other closings. A 50-year-old woman may be facing criminal charges after threatening to blow up the Social Security Administration building in Escanaba [MI], according to Escanaba Public Safety. The woman told police she was kidding but that she was upset with a disputed benefit issue. I guess she should get off. All it takes for Donald Trump to get out of a jam he's created by saying something stupid or insulting or criminal is to say that he was just kidding. Social Security's central offices in the Baltimore-Washington area are closed today because of a large snowstorm. Why Did It Take Four Trips To A Field Office To Straighten This Out? That was James Shambo’s reaction when he got a letter from the Social Security Administration congratulating him on starting up his benefits. Just to rub salt in the wound, Shambo later got an IRS form in the mail so he could pay taxes on the money he had never received and did not want. What was clear was that someone had stolen Shambo’s identity and made off with nearly $20,000 of his Social Security benefits. It’s a frightening tale of identity theft by a sophisticated criminal in what might be an unfolding consequence of last year’s Equifax breach. Members of Congress keep pressing Social Security to move all of its operations online. They just don't understand why the agency needs all of those field offices and tens of thousands of employees. Just let the computers do the work. They don't understand or care about the considerable risks. This man's story isn't unusual. This happens thousands of times a year. It's probably going to become more common. Was This Data Sharing Legal? A group of former students defrauded by for-profit colleges is alleging in court that the Education Department illegally obtained and used their Social Security data to limit their student loan relief. The Education Department announced in December that it will start granting some former students at the now-defunct Corinthian Colleges only partial federal student loan forgiveness, in part to save taxpayers' money. The agency said it will use students' earnings data to determine how much of their loans to forgive. Some students have already received notices from the department that only 50% or less of their loan will be wiped out. The Social Security Administration did not reply to requests for comment. The Obama administration went hard after for-profit colleges accused of fraud, closing down Corinthian and other major chains and tightening regulations for those schools. The administration also spent $550 million to fully forgive student loans for tens of thousands of students. [Secretary of Education Betsy] DeVos has said the Obama regulations were unfair and is writing new ones. She has said her new system of partial loan forgiveness will be fairer to students and taxpayers. I think these students ought to get full relief but that's not my point here. There are laws concerning inter-agency data releases. I'm no expert on them but this data release doesn't sound kosher. I have a question for those of you on the inside. Has Social Security started authorizing more overtime since the budget deal was finalized last month? For that matter, in the absence of a Commissioner, is there anyone to authorize it? It seemed clear that very little overtime had been authorized from the beginning of the fiscal year on October 1, 2017 until the budget deal last month. The agency had reason to fear that its appropriation would be cut below the previous year's level. Since the budget deal, it's clear there won't be a cut. It now seems likely that the agency will get a budget boost although how much is up in the air. It may be wishful thinking but I think I've seen a few signs in the last month that a Spring thaw might have started, that a little more OT is being authorized. It's certainly needed, or at least I think I'm seeing things getting a little less bad than it has been these past six months. 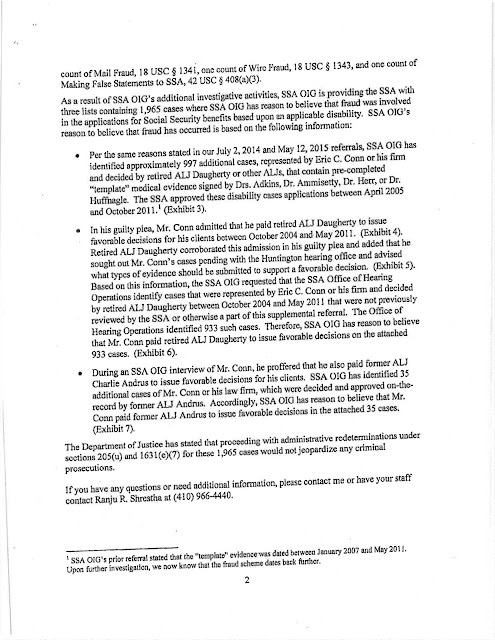 It may not be clear from this memo but many, perhaps most, of the claimants involved here weren't even Eric Conn's clients but the clients of one or more other attorneys who worked with Conn who haven't themselves been accused of misconduct. A phone scam is making the rounds again. Greenwood police say they've heard from residents that they've gotten calls from someone claiming to be from the Social Security Administration. This is how the scam works: They leave a message on your voicemail, claiming your social security number has been suspended and asking that you return the call and speak with a paralegal. Sharon Ramos, age 56, of South Bend, Indiana was sentenced before District Court Judge Jon E. DeGuilio for ten counts of making false entries in government records, two counts of conversion of government money, and one count of wire fraud, announced U.S. Attorney Thomas L. Kirsch II. Ramos, convicted after a four-day jury trial in November 2017, was sentenced to 46 months’ imprisonment and ordered to pay restitution to the Social Security Administration in the amount of $550,383.66. When Will The Budget Drama End? The federal government is operating on a Continuing Resolution (CR) that funds government operations only through next Friday, March 23. Unless something is passed before then the entire federal government, including Social Security, will shut down. Congress is working on an omnibus funding bill to fund all of the federal government through the rest of the fiscal year. In more normal times, this is done with a series of bills covering different parts of the federal government. There are still disagreements over the omnibus and some predictions that another short CR will be needed. The current draft or drafts of this bill have not been released to the public. There's no definite sign that Social Security's appropriation is in dispute but we can't be sure. The AARP has just sent a letter to Congressional leaders asking for higher administrative funding so they must think something is still up in the air. A federal administrative law judge signed a letter this week ruling that Adrianne Gunter’s multiple sclerosis has left her too sick to work, qualifying her for the government assistance known as Supplemental Security Income (SSI) — three months after she finally got a remote hearing via TV hookup and more than two years after she applied. Since January, Social Security has added eight judges to the two Philadelphia-area offices, for a total of 23 administrative law judges. Four area congressmen also wrote to Nancy Berryhill, acting commissioner of the agency, asking her to address the sometimes years-long delays for residents seeking hearings. One thing to keep in mind is that there are many people who believe themselves to be disabled by illness or injury who are not on Social Security disability benefits. Whatever has been going on probably has little or no connection to program developments at Social Security. There have been changes at Social Security over time but the only dramatic changes have been in backlogs. The Social Security Administration has updated the staff instructions in its POMS manual for Achieving a Better Life Experience (ABLE) accounts. These accounts allow the sheltering of money which would otherwise render a person ineligible for Supplement Security Income (SSI). I cannot evaluate the significance of these new instructions since I haven't been involved in ABLE issues. I'm glad the ABLE accounts exist but they're a sop to people who have money and want to help their disabled relatives get around the ridiculously stringent SSI resource limits. Most disabled people don't have relatives who can help them in this way. What's urgently needed are updated resource and income limitations for everyone on SSI. The SSI resource and income limitations contain no cost of living adjustment and haven't been updated since they were created in the 1970s. They're brutal. I know those who supported ABLE accounts also supported income and resource updates. I can't fault their decision that it was better to take ABLE than to get nothing but ABLE isn't nearly enough. When the time finally comes again when Democrats control Congress, an SSI update has to be very near the top of the entire Democratic agenda. There is no other issue in the Social Security world, apart from the agency's operating budget, that's anywhere near as important as an SSI update. Update: I'm told that this Middletown is in Ohio, not Pennsylvania. We provide the first publicly available statistics on the extent to which recent successive birth cohorts enter Social Security Disability Insurance (SSDI), and on cross-cohort trends in the average number of years of SSDI benefit receipt among cohort members. We find that the percentage of each birth cohort entering SSDI by ages 45, 50, and 55 is increasing. Mean years of benefit receipt among all individuals in the birth cohort has grown even more rapidly, due to the combined effects of entry at younger ages and lower mortality after entry. Our findings account for immigration, an important factor that is often ignored in discussions about growth in the SSDI rolls. Annual SSDI awards have declined sharply since 2010, after rising rapidly on the heels of the Great Recession. 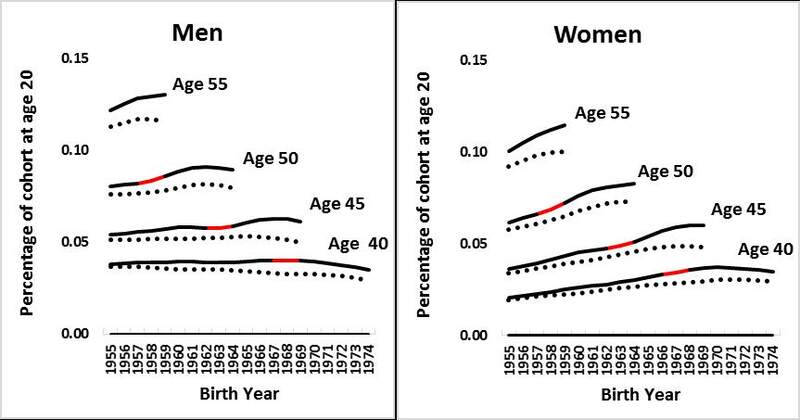 During the same period, the birth cohort data show a decline in SSDI entry by age 40, and a diminished rate of growth by age 55. Still, in 2014—the last year of our data—the rates of entry by ages 45 and 50 are well above what they were 10 years earlier. Viewing the data from the perspective of cohorts shows that there remains an urgent need to test and adopt policies to reduce avoidable labor force exit and SSDI entry by workers who experience work-threatening medical problems. 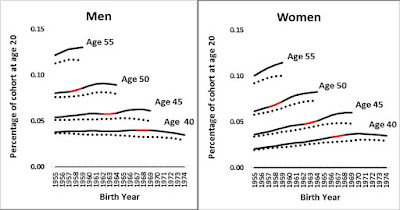 Trends in SSDI entry by age 40, 45, 50, and 55, as percentage of the size of the birth cohort in the SSA area population at age 20. Click to view full size. Those on the right will say that this proves that it's too easy to get on Social Security disability. However, it's not. It never has been and it's certainly not now. The problem is the near demise of manufacturing in the United States. People with low cognitive abilities or chronic psychiatric problems or other nagging health problems used to be able to hold down jobs in manufacturing, perhaps not as steadily as they would have liked but well enough to avoid having to file disability claims. Without manufacturing, these people have only a marginal ability to be employed. Jobs like Certified Nurse Attendant (CNA) at a nursing home or maintenance mechanic doing minor building repairs are hard to do if you have a bad back. Employers in these fields are less likely to put up with depressed employees with spotty attendance or employees with limited cognitive abilities who just can't seem to understand or remember how the job is supposed to be done. Those "simple, routine, repetitive" jobs aren't plentiful these days. If you work in an office, you may think that anyone can but that's not so. Those people you went to high school with who just barely managed to graduate or who didn't graduate, you probably didn't hang out with them. You didn't understand their problems then. You certainly don't understand them now. Sometimes, the problems that forced those students to the margins in high school go away or get better. Mostly, they stay the same or get worse. Those people are prime candidates for becoming disabled. The decline is American manufacturing has been properly blamed for the opioid epidemic, Rust Belt unemployment and the election of Donald Trump. This study is just finding another effect of the decline in manufacturing. Investment News reports on the brutal backlogs at Social Security and on the reason for them -- a lack of an adequate operating budget. Every day, Susan Babis wonders how she's going to pay even the smallest bills. Babis applied for Social Security disability benefits in July 2016. More than a year and a half later, she still hasn't had a hearing to determine whether she'll receive them. The government denied her application and she filed an appeal in January 2017. Earlier this year, she was informed she was scheduled for a hearing this September. The Social Security Administration turned down a request for an on-camera interview for this story. It also never responded to a request for the number of Missourians currently awaiting disability claims. The audio recording of the oral argument before the 6th Circuit Court of Appeals in the case of Hicks v. Commissioner of SSA is now available online. This is the first case to reach a Court of Appeals concerning the legal issues presented by Social Security's unprecedented reviews of the cases of former clients of Eric Conn.
Q: Last month I received a letter from Social Security telling me how to access the online account I had just established. The letter also told me to dial an 800 number or visit a Social Security office if I had not opened such an account. Two days later I received a second letter about my change of address request. I had done neither of these, so I went to the Akron Social Security office. The people there were friendly and professional. They deleted the online account and disallowed the change to a San Diego address. They also told me that my direct-deposit bank information had not been compromised. I asked whether it would be a good idea to open a legitimate online account and they helped me do so. Two things they were vague about: How did the scammer get my information and what could he or she accomplish with the bogus account. They also were unsure as to whether Social Security Administration would pursue this matter further. The 800 number in the letter is answered by a robot receptionist and it could not respond to my statement, "I did not open an online account." This motivated me to drive to Akron. A: It's a good thing -- a really good thing -- you didn't ignore that letter. I talked to the Social Security Administration about your problem. They said that, fortunately, near disasters like what you encountered don't happen often. Social Security's Inspector General plans to investigate the closure of a field office in Milwaukee. I don't see how they could find that the agency complied with its own policies. An Atlanta television station is reporting on one vet's struggle to get Social Security disability benefits. You must multiply this story by a million to begin to get a picture of what goes on at Social Security. So What Kind Of Pumpkin Did Social Security Turn Into At Midnight? Yeah, I know, I'm mixing metaphors. So? I've been looking at the Federal Vacancies Reform Act of 1998. Here's what I've discovered. Under 5 U.S.C. §3345 upon a vacancy in an office that requires Senate approval, the President can designate a person to serve as an acting officeholder. If the President doesn't make such a designation, the "first assistant" to the departed officeholder becomes the acting officeholder. In the case of the Social Security Administration, President Obama established a plan of succession. President Trump could have altered that plan but didn't. Under that plan, Nancy Berryhill became acting Commissioner. However, under that statute there can only be an acting officeholder up to certain time limits and 5 U.S.C. §3347 makes it clear that there is no other process by which a person can become or stay an acting officeholder beyond those time limits. Everyone is in agreement that that time period has passed for the office of Social Security Commissioner and that office is vacant. Once the time period has passed, 5 U.S.C. §3348(b)(1) says the office and the functions and duties of that office remain vacant until someone can properly qualify to become the officeholder. Under 5 U.S.C. 3348(a)(2)(A) the functions or duties of an office are defined as those established by statute and "required by statute to be performed by the applicable officer (and only that officer)." That means that Administrative Law Judges and Appeals Counsel members and other Social Security employees who are performing previously delegated duties are able to continue to perform their previously delegated duties during the vacancy of the office of Commissioner of Social Security. So can just about any other employee. However, what about duties that had not previously been delegated? Even though there's nothing in the statutes that would have prevented the Commissioner or Acting Commissioner from delegating essentially any of the duties of the office, I don't see how there's anybody available now to further delegate any duties. It is possible that Nancy Berryhill made some last minute delegations before her authority as Acting Commissioner expired so that there could be better continuity. If there were any such extraordinary delegations, I think it behooves Social Security to announce them. In any case, Social Security was already somewhat rudderless with Nancy Berryhill as Acting Commissioner (not that it was her fault) and is even more rudderless now. How rudderless may depend upon whether Nancy Berryhill made some extraordinary delegations of authority while still Acting Commissioner. There's also the question of how well those at the top at Social Security will work together with no one really in charge -- the "you're not my real mommy" problem if you will. I am writing regarding the anticipated closing of the “Mitchell St.” Social Security Administration (SSA) Field Office at 1710 S. 7th St. Ste. 200, Milwaukee, WI 53204. A local television station has picked up on the story of a security guard throwing an elderly man to the ground at a Social Security field office in Phoenix. Neither the guard nor the elderly man are identified. Police and firefighters converged on two Lake County offices Wednesday to investigate suspicious packages, although one quickly proved to be a hoax. 12 employees who came in contact with the letter were temporarily quarantined while the Hazmat team tested the substance, but the team soon determined the substance was not hazardous. At the same time, the Social Security Administration building in Leesburg was temporarily closed after employees received another suspicious package. Leesburg police did not immediately know what kind of package it was or how it arrived but said they were waiting for the Hazmat team to finish in Mount Dora and come investigate the suspicious substance there. The scares were the latest in a series of such hoaxes dating back to last year. Early in 2017, the Daily Commercial received a letter that threatened the life of President Donald Trump, and another mailed to the paper in December contained white powder inside a folded piece of looseleaf paper with the word ANTHRAX written across it. Lake County Fire Rescue’s hazardous materials team responded to the newspaper and determined that the substance was baking powder. No harmful substances were in those letters. No Acting Commissioner Means No Changes in Regulations And Who Knows What Else? I couldn't figure it out. The Office of Management and Budget (OMB) approved a Notice of Proposed Rule Making (NPRM) of new musculoskeletal Listings for Social Security on February 16, 2018. Normally, once a proposal like this is approved by OMB, it gets published in the Federal Register within a week or so but this one still hasn't shown up in the Federal Register. I think I know the reason for the delay. The NPRM needs the signature of the Commissioner or Acting Commissioner of Social Security. There's nobody to sign off on the NPRM since there's no valid Acting Commissioner. Social Security isn't going to be able to propose, much less finalize, any changes in its regulations until this Commissioner business gets resolved. And, while I'm thinking of it, can Social Security even take a position in litigation with no one running the show? Maybe they do if there's a valid General Counsel at Social Security but we probably have exactly the same problem there as exists with the Commissioner position. The agency has a few thousand cases pending in the federal courts. What about contracting? Can the agency sign any contracts? By the way, by statute, the Commissioner of Social Security is supposed to put forward its own proposed budget for the agency in addition to the President's proposed budget. The President's budget for FY 2019 came out recently but I don't believe there was ever a budget from Social Security. I think I now know the reason. And one last question, what about the Appeals Council and Administrative Law Judges? They operate on a delegation of authority from the Commissioner. Without a Commissioner, do they have authority to act? If that seems outlandish, take a look at this Supreme Court opinion which dealt in passing with the question of delegated authority when there was no one validly occupying the position whose responsibility was delegated. I'm wondering if we might get a recess appointment of a caretaker Commissioner to tide us over until next January. That would avoid the lengthy confirmation process for someone whose term of office would only last a few months. Of course, that would make sense, so it probably won't happen with Donald Trump as President. Social Security is saying they've known about this problem at least since last November. You have to assume that they have alerted the White House back then if not much earlier. It's several months later and the White House has done nothing. What does that tell you about the level of functioning in the Trump White House? At least Mussolini got the trains running on time. On January 20, 2017, I was honored to become the Acting Commissioner of the Social Security Administration. Starting with Social Security 41 years ago as a summer aide, the vital mission of this agency has always fueled my passion for public service. Yesterday, the Government Accountability Office, who is responsible for monitoring the timelines for vacancies in certain Federal government positions, determined that a limitation of 300 days applied to the Acting Commissioner. Out of an abundance of caution, the agency had already taken steps in November 2017 to ensure that agency operations continue uninterrupted. What steps were those that Social Security took in November 2017? Does This Mean That Nancy Berryhill Is Now The Acting Acting Commissioner Of Social Security? Pursuant to section 3349(b) of title 5 of the United States Code, we are reporting a violation of the Federal Vacancies Reform Act of 19981 (herein "the Vacancies Reform Act" or "Act") at the U.S. Social Security Administration (SSA) with respect to the Commissioner position. Specifically, we are reporting that the service of Nancy A. Berryhill as Acting Commissioner at SSA after November 17, 2017, is in violation of the Act. The Vacancies Reform Act establishes requirements for temporarily authorizing an acting official to perform the functions and duties of certain vacant positions that require Presidential appointment and Senate confirmation. The Act generally limits the period of time that such a position may be filled with an acting official to 210 days. 5 U.S.C. § 3346(a)(1). In the year of a transitional Presidential inauguration, that time period is extended to 300 days after the vacancy occurs with respect to any vacancy that exists during the 60-day period beginning on the transitional inauguration date. 5 U.S.C. § 3349a(b). Under the provisions of section 3349(b), the Comptroller General is required, upon a determination that an acting official has served longer than the allowable period of service, to report such findings to Congress, the President, and the Office of Personnel Management. 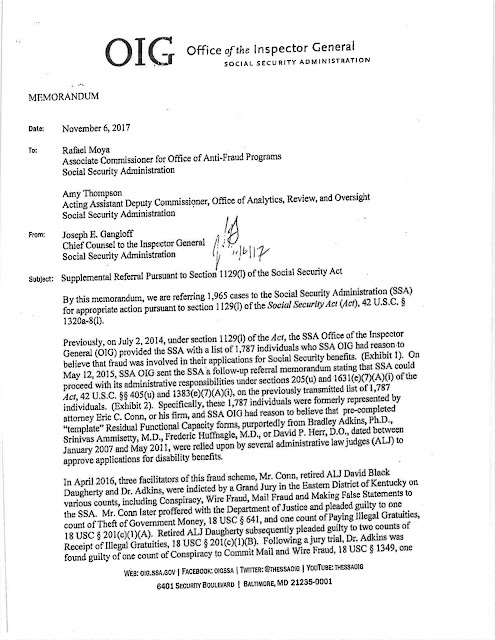 In response to our recent inquiry to all federal departments and agencies with positions subject to the Vacancies Reform Act to update the status of any vacancies, acting officials, or nominations, the General Counsel of SSA reported that the position of Commissioner remains vacant.2 Our research indicates that the position was vacant on January 20, 2017, and Nancy A. Berryhill became Acting Commissioner on January 21, 2017. To date there have been no nominations submitted for that position. According to SSA, Ms. Berryhill became Acting Commissioner pursuant to a memorandum of December 23, 2016, issued by President Obama establishing an order of succession for the performance of the functions and duties of the office of the Commissioner of Social Security (Memorandum of Succession). We note that the Memorandum of Succession specifies that its provisions are subject to the limitations of the Vacancies Reform Act. There will be a House Social Security Subcommittee hearing on this issue today. I've already been asked if there will be litigation on this. Maybe I lack imagination but I've not been able to think of anyone who would have standing to raise the issue. Attorneys who sue Social Security now have a problem. When we sue the agency, we are supposed to sue the Commissioner or Acting Commissioner by name. That's why Nancy Berryhill is the defendant in thousands of lawsuits. Who is now the proper defendant? I should say that this is a technicality that doesn't affect the validity of any lawsuit. Don't blame Nancy Berryhill for this. I doubt that she ever wanted the job even temporarily. She's a career employee. They generally try to avoid the limelight. The responsibility for this lies with President Trump. Don't expect Trump to nominate anyone soon. The current term for a Commissioner ends in January 2019. By the time anyone was confirmed now, their term would almost be at an end and they'd have to go through the confirmation process again. I don't know what RASR stands for. The bottom line is that Social Security is altering its process for recording the fact that an attorney is representing a claimant. I always cringe when Social Security makes this sort of change. Any alteration in this sort of process is disruptive. We can hope the disruption will be favorable -- easier processing for Social Security with fewer mistakes -- but in the short run there's probably a greater potential for mistakes. Can Social Security ALJs Be Distinguished From Other ALJs? The issue in the Lucia v. SEC case which the Supreme Court will almost certainly decide by the end of June is whether Administrative Law Judges (ALJs) at the Securities and Exchange Commission (SEC) are unconstitutional under the Appointments Clause of the Constitution because they were not appointed by the President or a Department head. Social Security leaders seem confident that this won't affect their agency. At least, they're doing nothing that suggests concern. I don't understand why. When it charged Eric Conn with federal crimes, the government estimated that the amount of money involved was $550 million. Around 1,800 claimants were involved. This means that they valued each case at around $300,000. In doing so, I think they weren't taking into account the value of Medicare benefits but let's leave that aside. The average Social Security Administrative Law Judge (ALJ) hears more than 500 cases a year. This means that based upon the value that the Department of Justice puts on these cases the average Social Security ALJ is deciding upon cases with a value of about $150 million per year. The standard for determining whether an officeholder is in "officer" as that term is used in the Constitution is whether that person exercises “significant authority pursuant to the laws of the United States.” OK, tell me your argument for why ALJs at the SEC are obviously inferior offices subject to the Appointments Clause while Social Security ALJs aren't. What does the fact that SEC cases are adversarial and Social Security cases aren't have to do with it? Most "inferior offices" in the federal government have no adjudicative role at all. The question is the decision-making authority involved. The plaintiff in the Lucia case, who promoted a scheme he called "Buckets of Money", was barred by an SEC ALJ from selling securities. (Real sympathetic test case they've got there.) My understanding is that's the sort of thing that SEC ALJs adjudicate. A Social Security ALJ has the power to decide whether a person has an income or not. Not infrequently, homelessness is on the line. If you're barred from selling securities, you move on to a new line of work, not a homeless shelter. On the whole, I'd say there's more at stake in the average Social Security ALJ case than the average SEC case (not to mention that each Social Security ALJ adjudicates far more cases than the average SEC ALJ), unless you think that any case involving wealthy people or corporations is inherently more consequential than a case involving an ordinary American. By the way, take a look at the 1988 Supreme Court decision in Morrison v. Olson. That case concerned whether independent counsels of that day passed muster under the Appointments Clause. The statute under consideration in that case is no longer in effect. Robert Mueller was appointed under Department of Justice regulations rather than the old statute. While Mueller was appointed by the acting head of the Department of Justice (the Attorney General had recused himself), he can only be removed for cause. It was the same situation faced by the Court in Morrison. If the Supreme Court decides that SEC ALJs are unconstitutional, it's going to have to make it clear that it doesn't mean to disturb Morrison or there's going to be litigation about the constitutionality of the Mueller appointment. Distinguish Robert Mueller. Distinguish Social Security ALJs. Distinguish Social Security Appeals Council members. Distinguish members of the Board of Veterans Appeals. Probably distinguish ALJs at some other agencies. That's a lot of distinguishing. Maybe finding SEC ALJs unconstitutional isn't worth all that distinguishing especially when no one seems to be able to come up with a bright line test to apply. I can't get over the fact that at a time when there are frequently lines of people waiting to be served at Social Security field offices and many people who try to call the agency end up hanging up in frustration because they have been on hold for so long that the Social Security Administration thought it appropriate to spend good money on a study to answer the burning question, "Can you tell how disabled someone is just by looking at how frequently they're treated at a hospital?" Honestly, someone ought to be fired over this. Perhaps everyone at Social Security central offices ought to be required to spend some time working on their agency's front line. Warning: Beltway Bandits At Work! A new report from the National Academies of Sciences, Engineering, and Medicine examines to what extent and in which ways health care utilization—such as in-patient hospitalizations, emergency department use, and hospital readmission—reflects disease severity, disability, and ability to perform gainful activity. The committee that conducted the study was unable to find an association between health care utilization and disease severity as it relates to the Social Security Administration's (SSA) determination of severe impairment—an impairment or combination of impairments severe enough to prevent a person from performing any gainful activity regardless of age, education, or work experience. The Social Security Administration paid these beltway bandits to tell us that there's no direct relationship between the number of hospital visits and the degree of disability! Anybody involved with disability determination could have told you that for free. I have clients with 300 page files who are obvious allowances. I have other clients with 2,000+ page files who have weak cases. Disability determination isn't about counting the number of pages of medical records any more than counting the number of hospital visits. The idea that there would be such a simplistic relationship is absurd on its face. There's a real beltway bandit touch to this report. Even though the Social Security Administration paid for this worthless study, the National Academies wants $50 for a copy of the report. By the way, if you did pony up the $50, I will bet you that there will be one unambiguous recommendation in the report -- more research. As I've said before, when someone goes to work for a beltway bandit, they must be told on their very first day of work, whenever you write a report, no matter what else it says, it must always give a firm recommendation for more research. The Social Security Administration has been without a Senate-confirmed Commissioner for more than five years since Commissioner Michael Astrue’s term expired on January 19, 2013. The current Acting Commissioner, Nancy Berryhill, has served in that role since January 20, 2017. The current six-year term for a Senate-confirmed Commissioner expires on January 19, 2019. Are We Sure That Online Filing Is A Good Thing?